Well when the ice is 10" thick, flyfishing is pretty much over until spring. I did manage to slab up some nice perch today with my 11 year old son. A couple even came jigged up on home tied flies. Most shallow to mid deep lakes and ponds in the Adirondacks will produce some nice perch and pike with the occasional walleye. Yellow perch are pretty tasty from the frying pan. Look like a great new years eve dinner. 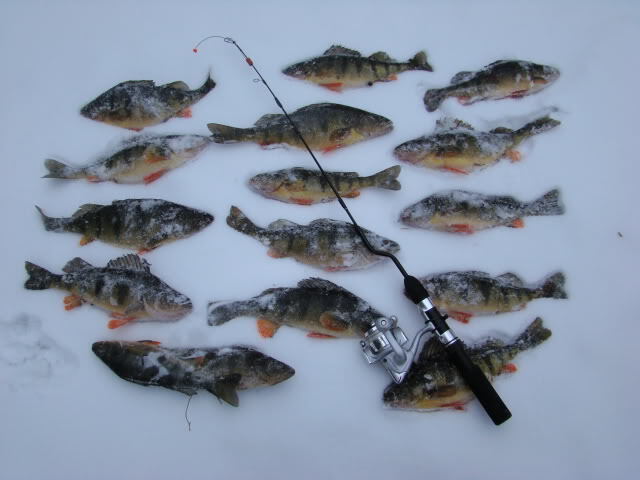 Looks like a good meal, nothing like fresh perch fillets through the ice. Hoping to get out myself this weekend, we have 4-6 inches of ice on some ponds. I like at least 6 to feel safe. I will never forget when I lived in Syracuse and stopped at big bay on Oneida Lake early in the ice fishing season ans there were 3 guys fishing on one inch of clear ice. You could see right through it and down to the bottom in 3 - 4 feet of water. Needless to say, when the whole surface bends and flexes whenyou walk, I turned around and went home. I am torn, ice fishing or one last try for a deer with my flintlock. Forgot to mention that my favorite ice rig for panfish is a teardrop jig on the bottom and a BH pheasant tail about 10 inches above that. Nice outting DH. I haven't been up for some time, but should make it Martin Luther King weekend. Hopefully I can get a little fishing in. Happy New Year.